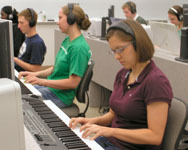 Students who have no previous music theory study and who cannot read music should take MUS 26100, Fundamentals of Music. If you play an instrument and have had some music theory training, you should enroll in MUS 36100, Music Theory I. Transfer students and those who have significant theory study may decide to be placed in MUS 36200, Music Theory II or MUS 36300, Music Theory III. Please contact Heather Philhower at 765-494-2787 or Karla Welchans 765-494-3708 to take an exam to be placed in one of the sections below.